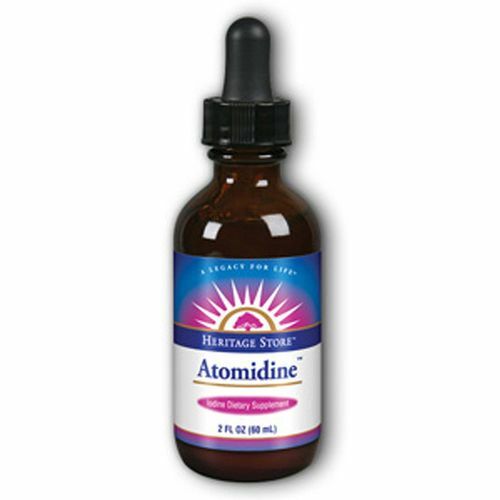 Heritage Products Atomidine features a concentrated dose of iodine. Warnings: Do not use this supplement in conjunction with any other concentrated source of iodine, such as Formula 636/637, Sea-Adine, Calcios or kelp tablets (not kelp salt). Over-stimulation of the thyroid gland with resulting nervousness may be experienced. People who are hyperactive or have cardiovascular difficulties should not use this because glandular stimulation might over stimulate the heart. Keep out of the reach of children. Notes: Free of pesticide residues. Recommended Use: Take 1 drop in water once daily, preferably in the morning. Use only as directed.